Cornell Dubilier Electronics (CDE) has announced significantly higher voltage values for its MLSH Slimpack series of hermetically sealed aluminium electrolytic capacitors. The unique components feature a true glass-to-metal seal that prevents dry-out of the capacitor electrolyte. As a result, they provide extraordinarily long life (5,000 hours) to more than meet the most demanding applications for defence and aerospace systems. With the line expansion just announced, they are now available in nine values, from 120µF to 3,200µF, with ratings up to 250VDC, says the company. The hermetic Slimpack is an offshoot of the well-established non-hermetic Flatpack series. The new MLSH Slimpack can be used as a replacement for parallel and series banks of wet tantalum capacitors for both new and existing designs. This change is especially beneficial where bulk storage is paramount. 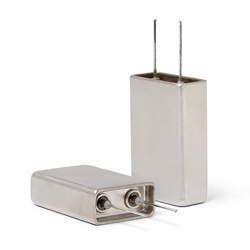 MLSH Slimpack devices measure 1 x 1.5 x 0.5 inch, weigh less and have more capacitance than a parallel bank of three or more wet tantalum capacitors. High rated capacitance is maintained at temperatures as low as -55C, a key requirement for power supplies used in defence and aerospace applications. Top-end temperature rating is 125C. All devices in the MLSH Slimpack series feature rugged stainless steel cases with a vibration rating of 80g. In most applications, there are significant cost and space savings vs. a comparably rated bank of wet tantalum capacitors. The new high-voltage MLSH Slimpacks eliminate the need for series banking, says the company.